Starbucks announced a price hike for the third time in three years. camera (AFP/Getty Images) A woman holds a Starbucks coffee cup in this file photo, March 28. 2013, in Silver Spring, Md. The latest jump in Starbucks coffee prices today makes a cup of joe a greater luxury for many. The price increase is 5 to 20 cents for most beverages starting today, which the company attributed to various business factors. Starbucks' "tall" and "venti" sizes of brewed coffee increase by 10 cents in "most markets" the company said. 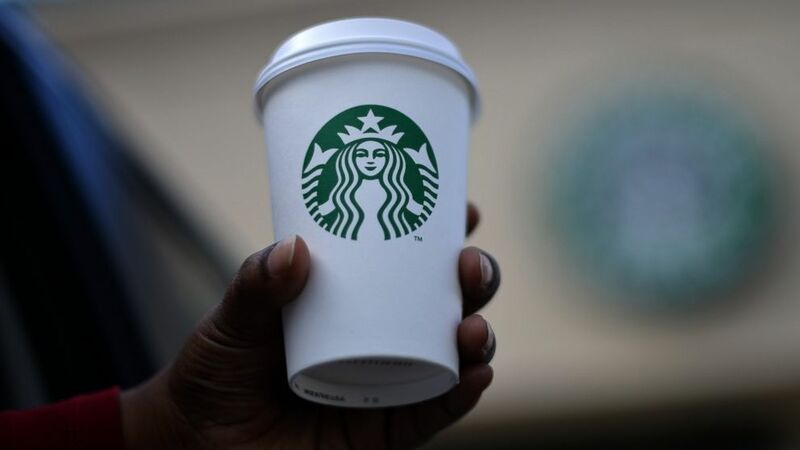 A "venti" coffee will be $2.45 in a majority of U.S. stores. At one New York City location, a "venti" Misto, a large coffee with steamed milk, jumped by 11 cents to $3.43. 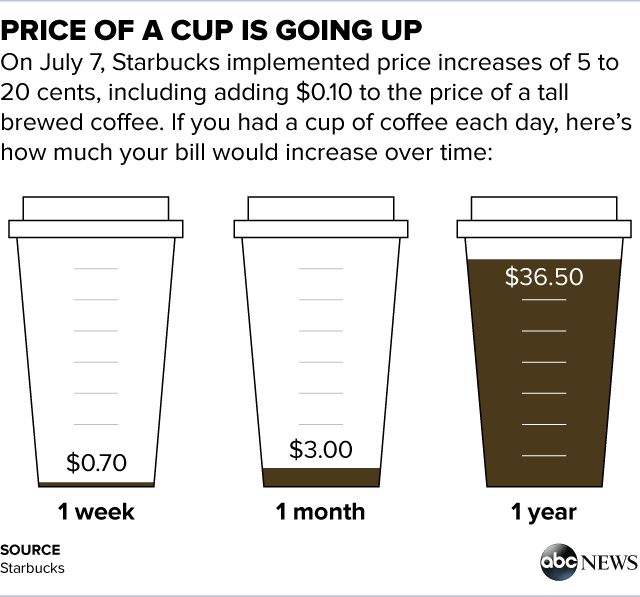 For Starbucks lovers who buy a tall brewed coffee every day of the week, a 10-cent increase will add up to an extra $36.50 a year. The company said it expects the average receipt to increase by 1 percent and that fewer than 20 percent of customers will be affected. R.J. Hottovy, senior restaurants analyst with Morningstar, said that the timing of the price increase seems a bit surprising on the surface, as coffee bean prices have generally come down in recent months. But when factoring in the other investments the company has been making the past months, the timing makes more sense, he said. This is true "particularly on the labor front," where the company has been raising wages for partners and shift supervisors, adding a food benefit program, developing new partner apps for viewing work schedules, on top of other efforts such as tuition reimbursement and health care benefits. "I suspect there will be little pushback from Starbucks customers, especially as we see increased penetration from mobile ordering in the back half of the year -- where prices aren't as transparent," Hottovy said. Starbucks' profit didn't register a hit when the company raised prices by an average of about 1 percent in the northeast and Sunbelt regions in 2011; nor when the company implemented a price hike of 5 to 20 cents in certain parts of the country last year. In most stores, there is no change to popular drinks, including the "grande brewed coffee frappuccino," iced coffee and shaken iced teas, the company said. Prices for Starbucks' food items and bagged coffee are not affected. A spokeswoman for Starbucks declined to attribute the broad price increase to one particular factor. "These adjustments are the result of balancing the cost of doing business in these market," according to a Starbucks statement. "Our pricing philosophy is to balance our need to run our business effectively while providing maximum value to our customers." The costs for retail stores includes "rent, labor, marketing, equipment, materials, distribution, and commodities -- including coffee -- but also other commodities associated with beverages, foods, materials and operations," the company said.